If you like to read quilting blogs, you may have seen a slew of adorable pincushions over the past month. If you like to read quilting blogs, you have also, no doubt, heard of Amanda Jean aka the wonderful Crazy Mom Quilts. I still remember when I discovered blogs in general about 8 years ago. And then I discovered there were quilting blogs and I felt like I’d found a bunch of new best friends! One of my favorites from the very beginning was Crazy Mom Quilts. And that hasn’t changed! Not only am I always inspired by her cheerful, scrappy, happy quilts, but I just love Amanda Jean’s voice. She has a gift for being so real and upbeat and encouraging and funny – she really makes you feel like you’re one of her good friends – and she’s just as genuine in person. So who doesn’t want to celebrate Amanda Jean’s release of her very own fabric collection! It’s called Good Neighbors (such a perfect name) and full of lots of clear, cheerful colors that coordinate already with almost anything you pair them with. Good Neighbors is sold solely through Connecting Threads. The prints are great blenders and cute, subtle prints that work well in lots of settings. Here’s a close up of some of the prints in the turquoise color way. To celebrate the arrival of Good Neighbors, Amanda Jean has organized a parade of pincushions all made from a Good Neighbors charm pack. Which is so perfect because I have been inspired by Amanda Jean’s cute collection of pincushions forever. I was so excited to finally have the motivation to make some myself. So I didn’t stop at just one. 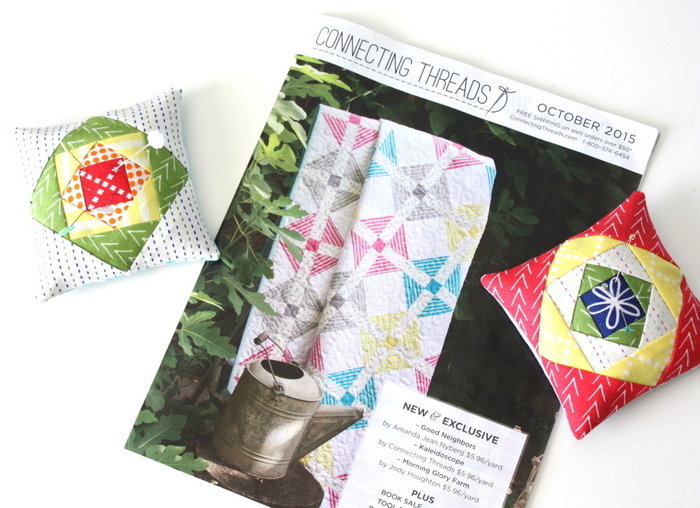 You can see Good Neighbors and other Connecting Threads originals (such as their Quilter’s Candy basics) on their website or through their catalog that comes in the mail. (You can request a copy of their catalog right on their home page.) There are some darling quilt patterns and kits made with Good Neighbors as well. Go here to see all of the pincushions in the Good Neighbors party, with links to each one. As part of the party, I also have a charm pack of Good Neighbors to give away! Just leave a comment on this post to enter to win. Enjoy! Love Amanda’s colors! Looks like you had fun with her fabrics too! Thanks for the op to win som more pretty fabric! Lol! So cute! I’ve been enjoying all the fun pincushions on the hop. Count me in! I love those fabrics! I’ve been a follower of hers for years too! But I also follow you! I can’t wait to order this fabric bundle – and extra yardage of the low volume prints. They are just perfect! Your pIncursions are so cute! I do lobe this fabric! Such a sweet line of fabric! Love you pincushion – thank you! Such a fun fabric line! I will definitely have to add some to my stash! Your pin cushions look great! Just saw the Good Neighbors line in the Connecting Threads catalog—so cute! I love the happy colors! I love this collection and connecting threads is a great company. I’ve purchased 3 or 4 times from them and I’m always happy with the quality. These pincushions are so cute! The fabrics are adorable. I love to make pincushions and I seem to be collecting them. Thanks for the giveaway. Great colors and great prints. I think this line will live forever. I love Crazy Mom Quilts and Connecting Threads! Good Neighbors looks wonderful in their latest catalog. I would be thrilled to win some! I might even make a pin cushion! Love your pincushions and this cheerful line of fabric! Yay for Amanda Jean!! Love the pincushions!! What a little beauty! I’m making one! Would love s charm pack to make more. Thanks for the chance. Such a cute fabric line, and I love all the pincushions! I’ve been inspired to make some myself! Love all the pincushions i have seen in this blog hop! Amanda Jean’s fabric line is amazing! SO cute! Love this line of fabric. Thanks for the giveaway. Cute square inside a square pincushion. Like how the squares just get smaller and smaller. Crazy Mom was one of my first blog discoveries also. Love this new line. Love your fussy cut flower in the middle. Thanks for the drawing. I am absolutely loving this fabric!! Now to decide how much of it I NEED in my stash! ? Great pincushions! I need to remember to get crushed walnut shells. I love this idea for a blog hop! What great eye candy! Such a happy little pin cushion, must make a few for myself and friends! I love CrazyMomQuilts! She was the first blog I started following. I also LOVE your pincushions and how perfect your center squares are! Adorable. Cute pincushions! I love reading your blog. Your pincushion is adorable! I also bought a bag of crushed walnuts from the pet store. You’ve inspired me to make some pincushions. Oh my goodness, that collection is beautiful! I need pincushions, and now I have a great way to use up all those scraps I can’t bear to get rid of! I love this collection! She did a fabulous job on it. And your pincushions turned out adorable. I especially like the pop of red on the outside of the blue centered one. I might have to jump on the pincushion wagon! Your color selections are lovely! What pretty fabric! Cheerful stuff. Loving all the pincushions on the tour. I already placed a small order for some of these fabrIcs. Love them! I am enjoying all the pin cushions being shared at this party. Love the colours you used. Beautiful fabric…..Amanda Jean is so talented. I love your pincushion! Cute pincushions! Your poor deprived children with no pet. 😉 We have a cat and fish – not so sure I’d want a pet that needed the crushed walnut shells. HI, neat little Pin cushions! Thanks to you for sharing! I would love a charm pack. Your discussions are very cute. Cute discussions? I meant cute pin cushions of course! Who doesn’t love a pincushion? And some free fabric? I love the fabric it lends itself to small items and background colors. The pin cushions have all been delightful too. Great pincushions, thanks for the giveaway! Such happy, cheerful fabric – I love it! Your pincushions are so adorable. This fabric line is so bright and cheery. Love it and the fabric line. New fabric lines are always so fun to see! I love this fabric! I have been enjoying seeing all the cute pin cushions too. 🙂 Thanks. how adorable!! Need to go shopping NOW!! I’m loving all these cute pincushions! And the Good Neighbors Collection!!! I too discovered many quilting blogs and have been inspired by everyone’s creativity… Amy, yours being one of my favorites? I love this cute pincushion! Thanks for the chance towin some of this cute fabric. I have to agree with the other comments here…cute and cheerful fabrics! Just found your blog via Instagram. So excited about it & Connecting Threads (another new site to me). Every pin cushion I see on this hop is one I want to make! Plus, the more I see the Good Neighbors bundle, the more I love it! Great use of color. When I heard that Amanda Jean had called her fabric line “Good Neighbors” I thought, “That is just perfect”. It really captures the warm-hearted, friendliness I associate with her. At every stop on this blog hop I’ve seen that same sentiment echoed. Another fun pin cushion using this super fun fabric line. I am hoping to sew a few pincushions myself, very soon. Your pincushions are adorable — I wish I could get over my paper-piecing phobia that make some myself! I love your pincushions! I too have resized a pattern to get it exactly how I like it. Love your pin cushions, especially the fussy cut centers – so cute! I LOVE quilting blogs!!! I could daydream and read all day long! This might be my favorite so far of the pincushions. Great ideas and fabrics! Will organize my stash of fabric and decide on a color to get! Thanks for the chance! I’ve never heard of using crushed shells as a filler, interesting. Love the fabric. I love your square in a square pincushions! 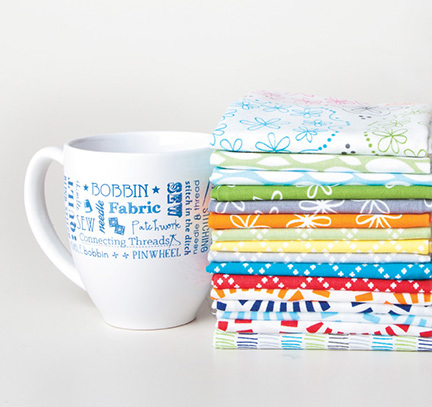 Good Neighbors is the perfect fabric line to add to your stash! I can’t wait to use some of her beautiful fabric! Wow what a great price for fabric! Sure wish more designers would do that with their fabric. Thanks for the chance to win this awesome fabric! The colors of this fabric are so pretty, but the turquoise is extra, extra nice! Love the fabric line. So cheerful. And I’ve been enjoying all the pincushions! Thanks for the opportunity to win. I love your pincushions! So adorable! Really cute and bright!! thank you for that giveaway. So cute pincushions. I love the way you fussy cut the centers. This is one of the best hops. I love seeing all the great pincushions. Thanks. Adorable! Such nice clear colours. It’s so fun to see what you have done with your charms. Looks like you were very purposeful in using every bit! I love this cute, colorful fabric line. And now I have a new quilt block to follow! This is the most fun blog hop ever! I love the versatility of the fabrics and seeing what everyone has come up with…super inspiring. Love your pin cushions and what a great name for the fabric collection. Love it! Good Neighbors! Beautifully-done pincushion! I really need to make one. Very cute! I love the colors and prints in this collection. Thanks for sharing. LOVE Amanda Jean’s new fabric line, Good Neighbors!!! Would love to win the charm pack….thanks for the giveaway!!! Cute pincushions! I especially love that dark blue center. I love these fabric so much, thanks for the giveaway! I love those fabrics and the darling little pincushions you’ve made! Pin cushions are in my future! I love the tiny square in a square idea! Thank you for giving the price on the fabric – I had assumed it would be more. This could be an upcoming purchase and I will be looking at the Connecting Threads catalogue for sure. I love your pincushions! Great colours! This is a gorgeous fabric line and I love what you did with it! 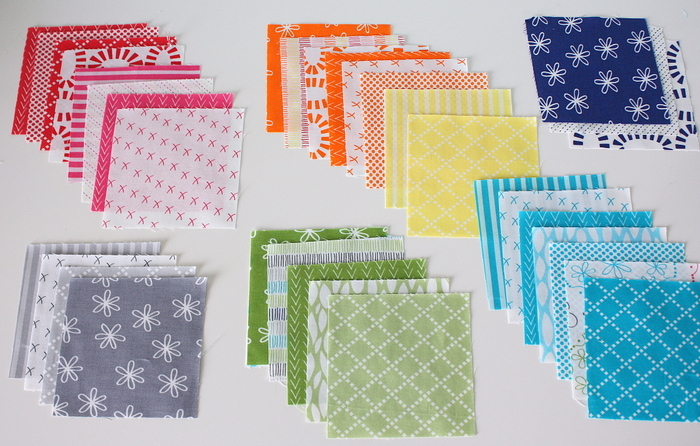 I really love these fabrics and paper piecing so your pincushion is a must make for me! Thanks for the inspiration and chance to win! Love Connecting Threads, love Amanda Jean’s fabric and loving this hop. I am going to try paper piecing to make your cute pin cushion. I’ve loved following this blog hop!! Such a lovely collection and love all the pincushions! Love these fabrics and your pincushions. Fun to see a different pincushion each day! So glad she I’d designing fabrics. I love her eye for color. So fun! Your pincushions look great! Paper piecing is the way to go with all those bitty pieces. When I first went shopping for crushed walnut shells, I discovered that not all pet stores carried them. They were only stocked in a pet store that sold snakes. I actually had to go into the snake room to get them. It makes me shudder just thinking about it. Thankfully I now have a supply that will last me for a good long time! Love these fabrics and your pincushion! I would love to win some of the Good Neighbors fabric!! Thanks for the giveaway! I love how Connecting Threads skips that middle man and keeps fabric prices reasonable. Amanda Jean’s fabrics are so fresh and perky and it is great they chose to work with her. And your pincushions are simply sweet. I love your pin cushions, especially the middle! So colorful too! Adorable fabrics! And Connecting Threads is one of my favorites! love the paper pieced pincushion. I like how you made the two pincushions with opposite shading! I LOVE these fabrics. I think a need a yard of each color and pattern. Yum! I love all the pincushions I have seen so far. If only I had the time to make all of them. Such fun colors in this collection- I love your pincushion with the yellow and red! These are perfect colors to break out in the middle of winter- so fun and cheerful! I adore your little pincushions~~love the soft colors in this fabric collection. Thanks for the opportunity to win. I love your sweet pincushion! Especially the tiny fussy cut middle! So adorable! What a lovely pin cushion! It would make a great gift for my sewing friends. Thanks for sharing. Another gorgeous little cushion! I am loving this blog hop! Gorgeous pin cushions. Love the fabrics. Thanks for the giveaway. Your pincushions are delightful! And I appreciate your comments on quilting blogs. I loved discovering them too! I really like the colors you chose for your pin cushions. Beautiful! I love Good Neighbors and I love Amanda Jean! I love Good Neighbors, and all the adorable pincushions I’ve seen on the blog hop! So cheerful! Too cute, I love it. That’s an incredible price for such beautiful fabrics. Love the pincushions. Thanks for the giveaway also. Gorgeous fabrics from one of my favorite bloggers, and cute pincushions from another! Thanks for the link to the pattern, and the generous giveaway, too. Your pin cushions are so cute. I love the fabric!! It’s nice to see a “party” where everyone can find something to make. Small, do-able and not using a lot of fabric…love it…very cute fabric! This Hop has been such fun! Am sooo inspired to make Pin Cushions now! lol Have never made one before!! Your’s is sooo cute! Love it!! blog, and now I am more excited! I love Amanda Jean’s fabric collection! And your pincushions are adorable!! the more of these great pincushions i see, the more i want to make one or two myself! So cute! I love the mini quilt block effect. I have loved seeing all the pincushions listed and blogged about. Its almost enough to make me take up more handwork, just so I could have an excuse to make more. Thanks for the giveaway. You can never have too many pincushions! Thanks for the opportunity. Darling pincushions with nice use of fussy cutting! I love Amanda’s new fabric line. She’s inspired me to make a few pincushions. I’ve loved your blog for years too! I am finding my way w/paper piecing and realize a pin cushion is a perfect starter. Love the way you capture the red X print and flower in the centers. Thanks for sharing…this has been a most fun hop, wouldn’t you agree! I agree with pretty much everything you said. 🙂 Thanks for the giveaway! Your pincushion is one I’d like to make for myself. Loving all the pin cushions and love the fabric collection! Cute pincushions ! I love this fabric! The very first pincushion I made was a paper pieced square in a square & I still use it today. I love your in these wonderful fabrics. Beautiful fabrics and your pincushions are adorable. Thanks for the opportunity to enter the giveaway. You are so right-those prints are the cutest and perfectly named! Yours was one of the first blogs I started to follow when I ‘discovered’ blogs back in 2010! Yay! Amy, I’ve never seen Square within a Square–I’m a beginner. Too cute! And I’m wild about Amanda Jean, her blog, and her Good Neighbors! Love your pincushions and Amanda Jean’s fabric. I love your work! Your blog and Amanda Jean’s are my two go to blogs. The color choices are so great! The pincushion is soooo cute. The Amanda Jean’s fabric is lovely and will be fun to work with. Cute, cute, cute! Would love to win a charm pack! I love your pincushions, especially the centers! I love the fabric and your selection really makes the pincushion sparkle!! Love love love this line. So clean and versatile. I would love to make these pin cushions too. Thank you for sharing the charm pack. I also want to add that I love the colors and the pincushions. I hope I win the charm pack because I just put a book order in (books are 40% off right now at Connecting Threads) and would have to pay separate shipping unless my 2nd order is over $50. Connecting Threads has a great sale going on right now. I shop there often. And, I’m going to take a look at the pincushion blogs. Thank you. Count me in on the giveaway! 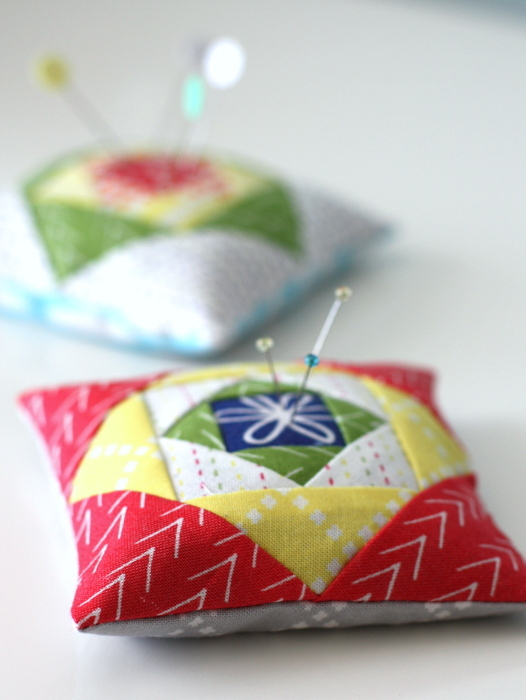 I LOVE these pin cushions… and would love to have a new charm pack to create a couple as gifts! So many cute projects on this blog hop. Such beautiful fabrics – such beautiful pincushions. Love the square in square design. It’s a square in a square in a square in a square!! Love. This might just be my favorite pincushion design! A pincushion party is perfect for this fabric!!!!!!!! I’m enjoying this Pincushion Party and seeing what everyone comes up with. The pincushions are all so unique and fun. Hope to win a charm pack to make my own. Love love love your blog. It’s been my favorite since I begin learning about quilting. You inspire me everytime I read your blog and your quilts are amazing!!!! Your work is so cute. Love the pincushion!!! Love these great new fabrics. Would love to tour your sewing room and see how you organize your stash and quilting supplies. I am sure I could learn many tips and secrets. Your talent is just awesome.